Baan Dada Children’s Home is an active member of its community and strives to relieve poverty and improve healthcare in the region by engaging in a number a community livelihood, education, and medical projects. These projects directly improve the lives of the villages and also teach our children the importance of giving back to the community. The Medical Outreach Program provides essential health care to remote communities in Burma along the Thai-Burmese border in Sangklaburi, Kanchanaburi. The present political instability in Burma, especially between the Burmese government and minority ethnic groups such as the Mon and Karen people, has forced the minorities to live near the border areas. Most of these remote villages on the Thai-Burma border lack basic medical health care services. The Outreach strives to provide vaccinations for children and pregnant mothers, a deworming program for children, a malaria prevention program, and an eyecare program for these remote communities. The total project cost for the Medical Outreach Program from November 2015 until October 2016 is 275,226 Thai Baht (U.S. $9,175). Our gratitude goes out to everyone who helped us in fundraising along the way. For more information on our medical outreach programs, please visit our “Medical Outreach Programs” page. With the flooding of several parts of Thailand in 2011, the children held a fundraising program to help the victims of the flooding. There was a live concert, Karen dance and yoga performances. Their very first benefit concert was named “A Small Voice Reaches Out, A Children’s Benefit Concert Of The Heart”. They raised 8,000 baht which they gave to the head of the village. A month later, they did another concert together with their school and three other NGOs, which together raised more than 70,000 baht. The ethnic minorities in Burma along the areas bordering Sangkhlaburi have experienced several military intrusions by the Burmese regime. This has caused an enormous influx of refugees fleeing the conflict. 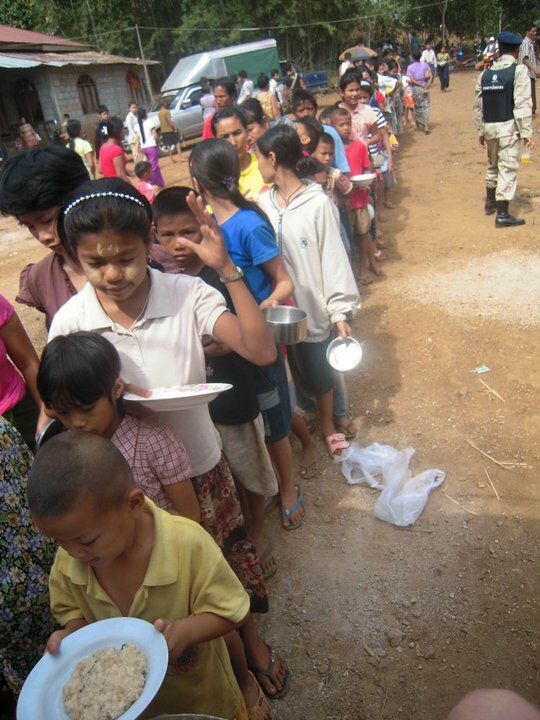 Baan Dada Children’s Home responded immediately to the needs of the displaced families by providing food supplies and water purifiers, and arranging food and a medic to be stationed at the temporary shelters at the Thai Border. Our response to such emergency situations is unfortunately limited due to lack of funding. Piloki Village is one of the villages in western Thailand that was affected by the building of the dam. This village is only accessible by boat and at the nearest point it takes an hour to reach. As a result of this economic and social isolation, the health and family stability of this community have been affected. The village is a mix of Karen, Mon, Thai, and Burmese. Baan Dada set up a fish raising livelihood project in 2008 funded by BCTFN (British Community in Thailand Foundation for the Needy). The project is no longer run by Baan Dada, but the people of Piloki. Goats were lent out to families in need while the goats reproduce. The family then keep the offspring and the original goats are returned to the foundation. Local Karen and Mon women are given the opportunity to earn an income by weaving and then selling their products. Currently we still employ one mother to make weaving products to sell and another lady who teaches sewing to some of the older girls. Here is a video of our weaving center and the girls in action making bracelets, scarves, and bags. People have the opportunity to stay with a local family to experience life here in Thailand and on the Burmese Border. This project is now run by the village of Piloki. The closest higher learning centre is 225km away! We plan to start a Technical School which will offer courses in Automotive Technology, Industrial Mechanics Technology, and Electrical Technology. The location of the school will be in Huay Ma Lai, on the property attached to the Children’s Home. There is a great need for a higher learning centre in this area for two main reasons, 1) the financial limitations of most families in the area, and 2) the travelling restrictions put on the non-Thais by the Thai government. We also plan to have an education extension program within Baan Dada for youth living in Burma, so one hour away from our site. Select individuals will be sponsored to come to our school. At the moment we are still raising funds to start building this school.